This article is about laws regarding U.S. citizenship. For citizenship in general, see Citizenship of the United States. The United States nationality law is a uniform rule of naturalization of the United States set out in the Immigration and Nationality Act of 1952, enacted under the power of Article I, section 8, clause 4 of the United States Constitution (also referred to as the Nationality Clause), which reads: Congress shall have Power - "To establish a uniform Rule of Naturalization..." The 1952 Act sets forth the legal requirements for the acquisition of, and divestiture from, American nationality. The requirements have become more explicit since the ratification of the Fourteenth Amendment to the Constitution, with the most recent changes to the law having been made by Congress in 2001. Adult citizens of the United States who are residents of one of the 50 states or the District of Columbia (Washington, D.C.) have the right to participate in the political system of the United States, as well as their state and local governments, (with most states having restrictions on voting by persons convicted of felonies, and a federal constitutional prohibition on naturalized persons running for President and Vice President of the United States), to be represented and protected abroad by the United States (through U.S. embassies and consulates), and to live in the United States and certain territories without any immigration requirements. Felons can vote in over 40 states, and in at least 2 while incarcerated. Felons can also serve jury duty if approved. Some U.S. citizens have the obligation to serve in a jury, if selected and legally qualified. Citizens are also required (under the provisions of the Internal Revenue Code) to pay taxes on their total income from all sources worldwide, including income earned abroad while living abroad. Under certain circumstances, however, U.S. citizens living and working abroad may be able to reduce or eliminate their U.S. federal income tax via the Foreign Earned Income Exclusion or the Foreign Tax Credit. U.S. taxes payable may be alternatively reduced by credits for foreign income taxes regardless of the length of stay abroad. The United States Government also insists that U.S. citizens travel into and out of the United States on a U.S. passport, regardless of any other nationality they may possess. Male U.S. citizens (including those living permanently abroad and those with multiple citizenships) from 18–25 years of age are required to register with the Selective Service System at age 18 for possible conscription into the armed forces. Although no one has been drafted in the U.S. since 1973, draft registration continues in the case of a possible reinstatement on some future date. Section 1 of the Fourteenth Amendment to the United States Constitution provides that "All persons born or naturalized in the United States, and subject to the jurisdiction thereof, are citizens of the United States and of the State wherein they reside." The Supreme Court has not explicitly ruled whether children born in the United States to immigrants illegally present in the country are U.S. citizens from birth, but it is generally presumed they are. The constitutional provision reads in pertinent part, "All persons born...in the United States and subject to the jurisdiction thereof, are citizens...". At least one parent lived in the United States prior to the child's birth. INA 301(c) and INA 301(a)(3) state, "and one of whom has had a residence." The FAM (Foreign Affairs Manual) states "no amount of time specified." A person's record of birth abroad, if registered with a U.S. consulate or embassy, is proof of citizenship. They may also apply for a passport or a Certificate of Citizenship as proof of citizenship. INA 301(g) makes additional provisions to satisfy the physical-presence requirements for periods citizens spent abroad in "honorable service in the Armed Forces of the United States, or periods of employment with the United States Government or with an international organization." Additionally citizens, who spent time living abroad as the "dependent unmarried son or daughter and a member of the household of a person" in any of the previously mentioned organizations can also be counted. The Child Citizenship Act of 2000 (CCA), which went into effect on February 27, 2001, amends the Immigration and Nationality Act (INA) to provide U.S. citizenship to certain foreign-born children—including adopted children—of U.S. citizens. To become a naturalized United States citizen, one must be at least eighteen years of age at the time of filing, a legal permanent resident (or non-citizen national) of the United States, and have had a status of a legal permanent resident in the United States for five years before they apply. (This 5-year requirement is reduced to three years if they (a) acquired legal permanent resident status, (b) have been married to and living with a citizen for the past three years and (c) the spouse has been a U.S. citizen for at least three years prior to the applicant applying for naturalization.) They must have been physically present for at least 30 months of 60 months prior to the date of filing their application. Also during those 60 months if the legal permanent resident was outside of the U.S. for a continuous period of 6 months or more they are disqualified from naturalizing (certain exceptions apply for those continuous periods of six months to 1 year). The territory of the United States, for the purposes of determining one's period of residence, includes the fifty states, District Columbia, Puerto Rico, U.S. Virgin Islands, Guam, and the Northern Mariana Islands. The Commonwealth of the Northern Mariana Islands has been added to this list effective November 28, 2009. Prior to that date, residence in the CNMI normally did not count as residence in the United States for naturalization purposes. American Samoa is not included into the territory of the United States for the purposes of determining one's period of residence (unless the person being naturalized is a US national, rather than a permanent resident alien; see below). An applicant for citizenship must be a "person of good moral character", and must pass a test on United States history and government. Most applicants must also have a working knowledge of the English language. There are exceptions, introduced in 1990, for long-resident older applicants and those with mental or physical disabilities. Some exemptions from permanent residency exist for certain qualifying naturalization applicants. For example, an undocumented immigrant who served in the US military during a designated period of hostility may naturalize without having first been a permanent resident. An immigrant who successfully completes the MAVNI program may naturalize in 10 weeks without first having been a permanent resident. Similarly, an immigrant who has made extraordinary contributions can be exempted from residency as well as the physical presence requirement and prohibitions for support of totalitarianism and or communism. A non-citizen U.S. national (see below) is also eligible for naturalization after becoming a resident of any state. For such persons (unlike most other applicants for naturalization), time spent in American Samoa counts as time spent in the United States for the purposes of determining residence and physical presence. The entire citizenship test is in the form of a one-on-one interview. The citizenship test has four components: a speaking/comprehension test, a reading test, a writing test and a civics test. For the civics test, applicants for citizenship are asked ten questions, and must answer at least six with the expected answers. U.S. Citizenship and Immigration Services has published a list of 100 sample questions (with the answers that should be given when taking the test), from which the questions asked are always drawn. The full list of questions is in the document "A Guide to Naturalization", available for free from the USCIS. The test examines the applicant's knowledge of American society and the English language. Sample questions and answers are published by the USCIS in English, Spanish, and Chinese. Besides passing the citizenship test, citizenship applicants must also satisfy other specific requirements of naturalization to successfully obtain U.S. citizenship. Whether this restriction applies to children born to non-U.S. citizens but adopted as minors by U.S. citizens is a matter of some debate, since the Child Citizenship Act of 2000 is ambiguous as to whether acquisition of citizenship by that route is to be regarded as naturalized or natural-born. Those who argue that the restriction does not apply point out that the child automatically becomes a citizen even though violating every single requirement of eligibility for naturalization, and thus the case falls closer to the situation of birth abroad to U.S. citizens than to naturalization. Some argue that the phrase "natural born citizen" describes a category of citizenship distinct from that described by the phrase "U.S. Citizen" in Article Two of the United States Constitution, and this was discussed during the constitutional convention of 1787. While it is true that "natural born citizen" is not defined anywhere within the text of the Constitution and that the Constitution makes use of the phrase "citizen" and "natural born citizen", Supreme Court Decisions from United States v. Wong Kim Ark to the present have considered the distinction to be between natural-born and naturalized citizenship. In her 1988 article in the Yale Law Journal, Jill Pryor wrote, "It is well settled that 'native-born' citizens, those born in the United States, qualify as natural born. It is also clear that persons born abroad of alien parents, who later become citizens by naturalization, do not. But whether a person born abroad of American parents, or of one American and one alien parent, qualifies as natural born has never been resolved." An April 2000 CRS report by the Congressional Research Service, asserts that most constitutional scholars interpret the phrase "natural born citizen" as including citizens born outside the United States to parents who are U.S. citizens under the "natural born" requirement. Chester Arthur, born in the U.S. state of Vermont of an American mother and Irish father, was sworn in as president, but his status as a "natural-born citizen" was challenged on the grounds that he was allegedly born in Canada or Ireland. Presidential candidates George W. Romney (born in Mexico), Ted Cruz (born in Canada), Barry Goldwater and John McCain (born in U.S. territories), were never seriously challenged on the basis of their "natural born" citizenship, but no candidate falling under this classification has been elected president. Charles Curtis falls under this classification by birth in Kansas Territory, was elected and served as vice president, proving constitutional eligibility for president. Similarly, Al Gore was born in Washington, D.C., and yet was elected and served as vice president, provides additional evidence of Constitutional eligibility even though he too was born outside a US state. Based on the U.S. Department of State regulation on dual citizenship (7 FAM 082), the Supreme Court of the United States has stated that dual citizenship is a "status long recognized in the law" and that "a person may have and exercise rights of nationality in two countries and be subject to the responsibilities of both. The mere fact he asserts the rights of one citizenship does not, without more, mean that he renounces the other", Kawakita v. U.S., 343 U.S. 717 (1952). In Schneider v. Rusk, 377 U.S. 163 (1964), the U.S. Supreme Court ruled that a naturalized U.S. citizen has the right to return to his native country and to resume his former citizenship, and also to remain a U.S. citizen even if he never returns to the United States. Although the U.S. government does not endorse dual citizenship as a matter of policy, it recognizes the existence of dual citizenship and completely tolerates the maintenance of multiple citizenship by U.S. citizens. In the past, claims of other countries on dual-national U.S. citizens sometimes placed them in situations where their obligations to one country were in conflict with the laws of the other. However, as fewer countries require military service and most base other obligations (such as the payment of taxes) on residence and not citizenship, these conflicts have become less frequent. A U.S. citizen may lose his or her dual citizenship by obtaining naturalization in a foreign state, by taking an oath or making an affirmation or other formal declaration of allegiance to a foreign state or political subdivision thereof, by serving in the armed forces of a foreign state, or by performing certain other acts, but only if the act was performed "voluntarily and with the intention to relinquish U.S. nationality". One circumstance where dual citizenship may run counter to expectations of government agencies is in matters of security clearance. For example, any person granted a Yankee White vetting must be absolutely free of foreign influence, and for other security clearances one of the grounds that may result in a rejected application is an actual or potential conflict of national allegiances. Visa requirements for the United States citizens are administrative entry restrictions by the authorities of other states placed on citizens of United States. According to the 2017 Visa Restrictions Index, holders of a United States passport can visit 174 countries and territories visa-free or with visa on arrival. The United States passport is currently ranked joint 3rd alongside in terms of travel freedom in the world. the U.S. Virgin Islands from 1917 to 1927 when citizenship was granted by an act of Congress in 1927. The nationality status of a person born in an unincorporated United States Minor Outlying Island is not specifically mentioned by law, but under Supreme Court decision they are also regarded as non-citizen U.S. nationals. In addition, residents of the Northern Mariana Islands who automatically gained U.S. citizenship in 1986 as a result of the Covenant between the Northern Marianas and the U.S. could elect to become non-citizen nationals within 6 months of the implementation of the Covenant or within 6 months of turning 18. 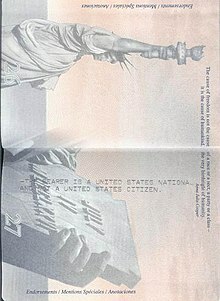 Non-citizen U.S. nationals may reside and work in the United States without restrictions, and may apply for citizenship under similar rules as foreign nationals or citizens, except that they do not need to hold U.S. permanent resident status when they apply or to have held it for any length of time before applying. Like permanent residents, they are not currently allowed by any U.S. state to vote in federal or state elections, although, as with permanent residents, there is no constitutional prohibition against their doing so. Like U.S. citizens, non-citizen U.S. nationals may transmit their non-citizen U.S. nationality to children born abroad, although the rules are somewhat different from the rules for U.S. citizens. The 14th amendment applies to incorporated territories, so people born in incorporated territories of the U.S. (currently, only the Palmyra Atoll) are automatically U.S. citizens at birth. Separate sections of law handle territories that the United States has acquired over time, such as Alaska 8 U.S.C. § 1404 and Hawaii 8 U.S.C. § 1405, both incorporated, and unincorporated Puerto Rico 8 U.S.C. § 1402, the U.S. Virgin Islands 8 U.S.C. § 1406, and Guam 8 U.S.C. § 1407. Each of these sections confer citizenship on persons living in these territories as of a certain date, and usually confer native-born status on persons born in incorporated territories after that date. For example, for Puerto Rico, all persons born in Puerto Rico between April 11, 1899, and January 12, 1941, were automatically conferred U.S. citizenship as of the date the law was signed by the President Harry S. Truman on June 27, 1952. Additionally, all persons born in Puerto Rico on or after January 13, 1941, are citizens at birth of the United States. Note that because of when the law was passed, for some, the citizenship status was retroactive. The law contains one other section of historical note, concerning the Panama Canal Zone and the nation of Panama. In 8 U.S.C. § 1403, the law states that anyone born in the Canal Zone or in Panama itself, on or after February 26, 1904, to a mother or father who is a United States citizen, was "declared" to be a United States citizen at birth. Currently under the Immigration and Nationality Act of 1952 (INA) effective from December 24, 1952 to present the definition of the "United States" for nationality purposes, was expanded to add Guam; and, effective November 3, 1986, the Northern Mariana Islands (in addition to Puerto Rico and the Virgin Islands of the United States). Persons born in these territories on or after December 24, 1952 acquire U.S. citizenship at birth on the same terms as persons born in other parts of the United States; and "Outlying possessions of the United States" was restricted to American Samoa and Swains Island. Congressional Research Service Report number RL30527 of April 17, 2000, titled "Presidential Elections in the United States: A Primer" asserts that citizens born in Guam, Puerto Rico, and the U.S. Virgin Islands are legally defined as natural born citizens, and are, therefore, also eligible to be elected president. As a historical matter, U.S. citizenship could be forfeited upon the undertaking of various acts, including naturalization in a foreign state (with a willful intent to renounce U.S. citizenship) or service in foreign armed forces. In addition, before 1967 it was possible to lose the citizenship due to voting in foreign elections. However, the Supreme Court ruled unconstitutional the provisions of Section 349(a) which provided for loss of nationality by voting in a foreign election in the case Afroyim v. Rusk, 387 U.S. 253,8 U.S.C. § 1481 specifically outlines how loss of nationality may occur, which predominantly involves willful acts over the age of 18 with the intention of relinquishing United States nationality. U.S. Supreme Court decisions beginning with Afroyim v. Rusk constitutionally limited the government's capacity to terminate citizenship to those cases in which an individual engaged in conduct with an intention of abandoning their citizenship. In 1990, the U.S. State Department adopted new regulations which presume that an individual does not intend to give up citizenship when performing one of the above potentially expatriating acts. If asked, the individual can always answer that they did not intend to give it up; this is sufficient to retain their citizenship. Hence, the U.S. effectively allows citizens to acquire new citizenships while remaining a U.S. citizen, becoming a dual citizen. After a U.S. citizen satisfies the Department of State procedures, the Department of State issues a Certificate of Loss of Nationality (CLN) signifying that the Department of State has accepted the U.S. Embassy/Consulate's recommendation to allow the renunciation. Renunciation of citizenship includes renunciation of all rights and privileges of citizenship. A person who wants to renounce U.S. citizenship cannot decide to retain some of the privileges of citizenship, as the State Department regards this as logically inconsistent with the concept of renunciation. Thus, such a person can be said to lack a full understanding of renouncing citizenship or lack the necessary intent to renounce citizenship, and the Department of State will not approve a loss of citizenship in such instances. People giving up U.S. citizenship may be subject to an expatriation tax. 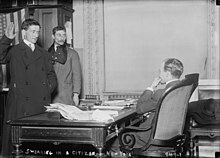 Originally, under the Foreign Investors Tax Act of 1966, people determined to be giving up citizenship for the purpose of avoiding U.S. taxation were subject to 10 years of continued taxation on their U.S.-source income, to prevent ex-citizens from taking advantage of special tax incentives offered to foreigners investing in the United States. Since 2008, these provisions no longer apply; instead, ex-citizens who meet certain asset or tax liability thresholds pay a one-time capital gains tax on a deemed sale of their U.S. and non-U.S. assets, regardless of their reasons for giving up citizenship. The Reed Amendment, a 1996 law, makes former citizens inadmissible to the U.S. if the Attorney General finds that they renounced citizenship for purposes of avoiding taxes; however, it has never been enforced. Proposals such as the Ex-PATRIOT Act to rewrite the Reed Amendment and make it enforceable failed in 2012 and 2013. It is also possible to forfeit U.S. citizenship upon conviction for an act of treason against the United States. Prominent former Nazi officers who acquired American citizenship have also had it revoked if the Office of Special Investigations has been able to prove that the citizenship was obtained by concealing their involvement in war crimes committed by the Nazis in World War II. 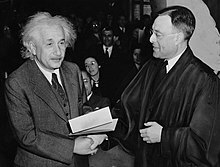 ^ "An Albert Einstein Chronology". American Institute of Physics. Archived from the original on July 15, 2007. Retrieved August 6, 2007. ^ a b c d e f g h i j k "3 different United States (Hooven & Allison vs Evatt)". Archived from the original on August 21, 2016. ^ a b c d e f g h i j k Black's Law 6th. p. 1533. ^ "Foreign Earned Income Exclusion". Internal Revenue Service. Archived from the original on September 27, 2007. Retrieved October 1, 2007. ^ "Dual Nationality". travel.state.gov. Retrieved April 28, 2018. ^ WHO MUST REGISTER Archived May 7, 2009, at the Wayback Machine, U.S. Selective Service System website Archived 2015-07-13 at the Wayback Machine. ^ Judges Bring History to Naturalization Ceremonies Archived April 7, 2010, at the Wayback Machine, May 2008 issue of The Third Branch Archived March 7, 2010, at the Wayback Machine, The Newsletter of the Federal Courts. ^ "THE CONSTITUTION OF THE UNITED STATES OF AMERICA As Amended" (PDF). 110th Congress, First Session, House of Representatives, Document No. 110-50. United States Government Printing Office. July 25, 2007. ^ "Elk v. Wilkins". United States Reports. 112: 94–123. 1884. ^ a b "American Samoa and the Citizenship Clause: A Study in Insular Cases Revisionism" (PDF). Harvard Law Review. 130: 1680–1703. April 10, 2017. Archived (PDF) from the original on October 27, 2017. Retrieved October 27, 2017. ^ "United States v. Wong Kim Ark". United States Reports. 169: 649–732. 1898. ^ The Heritage Foundation (2005). The Heritage Guide to the Constitution. Washington, D.C.: Heritage Foundation. pp. 385–389. ISBN 1-59698-001-X. ^ Erler, Edward J; Thomas G West; John A Marini (2007). The Founders on Citizenship and Immigration: Principles and Challenges in America. Lanham, Maryland: Rowman & Littlefield. p. 67. ISBN 0-7425-5855-X. ; cf. also the opinion in 8 FAM 301.1-1.d: "All children born in and subject, at the time of birth, to the jurisdiction of the United States acquire U.S. citizenship at birth even if their parents were in the United States illegally at the time of birth." ^ a b c "Acquisition of U.S. Citizenship By a Child Born Abroad". —. U.S. Department of State. Archived from the original on September 7, 2015. Retrieved June 25, 2017. ^ Stohr, Greg. "Gender-Based Citizenship Rules Unconstitutional, Supreme Court Says Archived 2017-06-12 at the Wayback Machine". Bloomberg. June 12, 2017. ^ de Vogue, Ariane. "Supreme Court strikes down law that treats children born overseas to unmarried parents differently". CNN. June 12, 2017. ^ "Fact Sheet – Child Citizenship Act" (PDF). U.S. Department of justice. Archived (PDF) from the original on October 16, 2011. ^ a b c "Naturalization". U.S.Citizenship and Immigration Services. Archived from the original on May 16, 2008. Retrieved October 1, 2007. ^ "Act 101(a)15P - USCIS". www.uscis.gov. Archived from the original on April 23, 2018. Retrieved April 28, 2018. ^ "Continuous Residence - Chapter 3, Part D, Volume 12 - Policy Manual - USCIS". www.uscis.gov. Archived from the original on February 21, 2018. Retrieved April 28, 2018. ^ "General Naturalization Requirements". U.S.Citizenship and Immigration Services. Archived from the original on September 28, 2013. Retrieved September 25, 2013. ^ David D. Murray. "A Brief History Of US Immigration..." ilw.com. Archived from the original on October 12, 2007. Retrieved October 1, 2007. ^ "Military Service during Hostilities (INA 329) - Chapter 3, Part I, Volume 12 - Policy Manual - USCIS". www.uscis.gov. Archived from the original on February 21, 2018. Retrieved April 28, 2018. ^ "Military". uscis.gov. Archived from the original on March 19, 2018. Retrieved April 28, 2018. ^ a b "Chapter 2: LPR Admission for Naturalization - Exceptions". U.S.Citizenship and Immigration Services. Archived from the original on September 30, 2013. Retrieved September 25, 2013. ^ a b "Title 8: Aliens and Nationality - PART 325: NATIONALS BUT NOT CITIZENS OF THE UNITED STATES; RESIDENCE WITHIN OUTLYING POSSESSIONS". Electronic Code of Federal Regulations (e-CFR). United States Government Publishing Office. Archived from the original on February 27, 2017. Retrieved February 27, 2017. ^ "Article "U.S. Citizenship Test – What is it all about?"". Archived from the original on December 23, 2016. ^ "Form M-685 Pathway to U.S. Citizenship" (PDF). USCIS. Archived (PDF) from the original on November 7, 2013. Retrieved April 25, 2009. ^ John R. Vile (2005). "President, Qualifications". The Constitutional Convention of 1787: a comprehensive encyclopedia of America's founding. ABC-CLIO. pp. 605–606. ISBN 978-1-85109-669-5. ^ "PRESIDENTIAL ELECTIONS IN THE UNITED STATES: A PRIMER" (PDF). Congressional Research Service. United States Congressional Research Service. April 17, 2000. Archived (PDF) from the original on March 31, 2010. Retrieved January 18, 2010. ^ https://www.uscis.gov/sites/default/files/files/article/M-476.pdf This article incorporates text from this source, which is in the public domain. ^ "Expeditious naturalization forchildren born outside the United States". U.S. Department of State. Archived from the original on September 20, 2007. Retrieved October 1, 2007. ^ "Dual Citizenship". Archived from the original on February 1, 2009. Retrieved March 18, 2009. ^ "US State Department Services Dual Nationality". U.S. Department of State. Archived from the original on October 14, 2012. ^ "Advice about Possible Loss of U.S. Nationality and Dual Nationality". travel.state.gov. Archived from the original on April 14, 2018. Retrieved April 28, 2018. ^ "The 41 nationalities with the best quality of life". www.businessinsider.de. February 6, 2016. Retrieved September 10, 2018. ^ An Act to provide for the complete independence of the Philippine Islands, to provide for the adoption of a constitution and a form of government for the Philippine Islands, and for other purposes., Pub.L. 73–127, 48 Stat. 456, enacted March 24, 1934; §8, "... For the purposes of the Immigration Act of 1917, the Immigration Act of 1924 (except section 13(c)) this section, and all other laws of the United States relating to the immigration, exclusion, or expulsion of aliens, citizens of the Philippine Islands who are not citizens of the United States shall be considered as if they were aliens." ^ "Constitutional Topic: Citizenship". U.S. Constitution Online. Archived from the original on December 11, 2008. Retrieved November 22, 2008. ^ See 8 U.S.C. § 1101(a)(36) and 8 U.S.C. § 1101(a)(38) Providing the term "State" and "United States" definitions on the U.S. Federal Code, Immigration and Nationality Act 8 U.S.C. § 1101a. ^ "8 FAM 302.1 Historical Background to Acquisition by Birth in U.S. Territories and Possessions". U.S. Department of State Foreign Affairs Manual. U.S. Department of State. June 27, 2018. Retrieved July 18, 2018. ^ "PRESIDENTIAL ELECTIONS IN THE UNITED STATES: A PRIMER" (PDF). Congressional Research Service. United States Congressional Research Service. April 17, 2000. Archived from the original on January 13, 2012. Retrieved December 3, 2009. ^ "Advice about Possible Loss of U.S. Citizenship and Foreign Military Service". U.S. Department of State. Archived from the original on February 2, 2011. Retrieved February 9, 2011. ^ Carmen A. DiPlacido; Meszaros, Michael (June 12, 1996). "22 CFR Part 50: Nationality Rules" (PDF). Federal Register. 61 (114): 29651. Archived (PDF) from the original on January 8, 2016. Retrieved February 16, 2014. ^ a b "Possible Loss of U.S. Citizenship and Dual Nationality". U.S. Department of State. Archived from the original on April 16, 2009. Retrieved October 1, 2007. ^ "Alberto O. LOZADA COLON, Plaintiff, v. U.S. DEPARTMENT OF STATE, et al., Defendants". The United States District Court, District of Columbia. Archived from the original on March 26, 2010. Retrieved January 9, 2010. ^ "Renunciation of U.S. Citizenship". U.S. Department of State. Archived from the original on January 14, 2010. Retrieved January 14, 2010. ^ "Foreign Investors Tax Act of 1966; Presidential Election Fund Act; and other amendments". United States Senate Committee on Finance. October 11, 1966. p. 28. Archived from the original on April 13, 2013. Retrieved June 4, 2014. ^ Pfeifer, Michael G. (September 28, 2009). "United States: The Final State of Expatriation? Omissions and Technical Issues Under the HEART Act". Mondaq.com. Archived from the original on November 5, 2013. Retrieved May 12, 2012. ^ Buss, David; Hryck, David; Granwell, Alan (August 2007). "The U.S. Tax Consequences of Expatriation: Is It a Tax Planning Opportunity or a Trap for the Unwary?" (PDF). International Tax Strategies. Archived (PDF) from the original on February 1, 2014. Retrieved May 18, 2012. ^ Virginia La Torre Jeker (December 30, 2013). "Past And Proposed Anti-Expat Legislation: Interview With Bill Yates, Former IRS Attorney (International)". AngloInfo. Angloinfo. Archived from the original on July 14, 2016. Retrieved June 15, 2016. ^ "THE LAST". Bozeman Daily Chronicle. Bozeman, Mont. April 4, 2010. p. H.8. ^ Carter, Mike (December 12, 2009). "U.S. citizenship trial delayed for elderly Washington state man allegedly involved in Nazi death squad". McClatchy – Tribune News Service. Washington. Robert James McWhirter (2007). The citizenship flowchart. American Bar Association. ISBN 978-1-59031-921-5.